On a remote island like Niue, getting to know the locals is as easy as stepping outside your guesthouse door. A cultural exchange with a local was bound to happen—we just had no idea when or how. We met the Tongia family from nearby Tonga on our 3rd day in Niue. 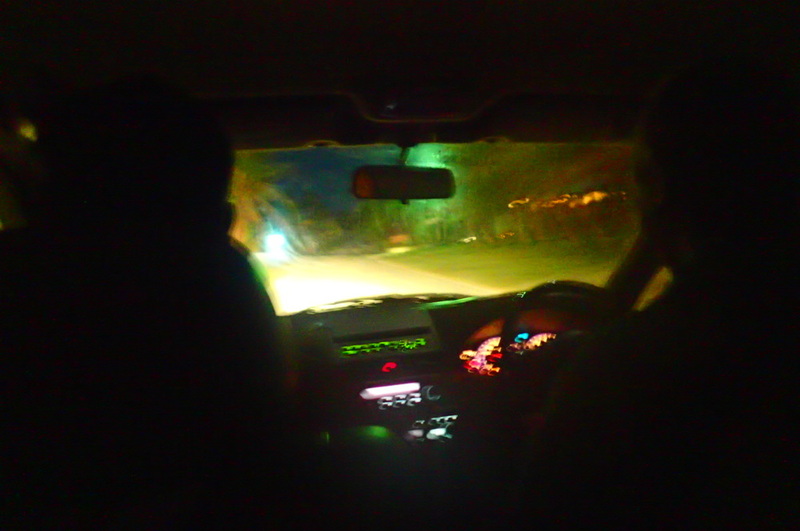 Palemia, a shuttle driver for Matavai resort, gave us a ride home from dinner. He then offered Jono a chance at free diving with a local spear-fisherman. As a thanks, we offered to help him and his wife, Louna, with their farm work. We ended up planting potatoes through the middle of the night and enjoying other wonderful cultural exchanges with this delightful little Tongan family who live and work in Niue. 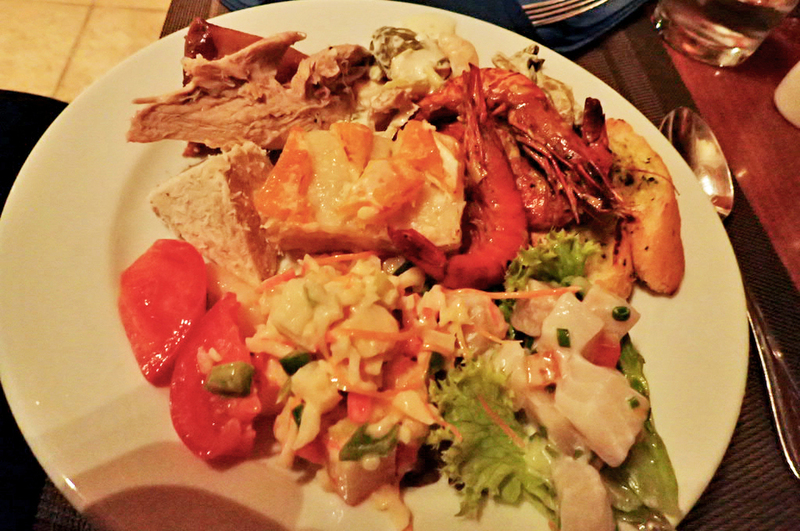 Fittingly, this story begins with a Niuean cultural dinner at Matavai Resort. Entertainment included a 4 piece band drumming out an island beat all night with Niuean young people and children dancing along. At one point, one of the young dancers brought me up to the front where I learned their traditional dance. She was adorable! The food was mostly all authentic Niuean dishes. These included ingredients like taro root, paw paw (papaya), and coconut cream. My favorite dish was Takihi. Labeled as a traditional Niuean dish, it was made of thinly sliced layers of paw paw and white taro root, marinated in coconut cream. The dish is baked in an oven or, more traditionally, in an umu. An umu is an “Earth oven” used in Polynesian traditional cooking. They burn firewood, coconut shells, and coconut husks in a hole, then layer big rocks on top, place the food over the heated rocks, then another layer of leaves on top of that. All natural. All yum! Around 9:30, we got the Matavai shuttle back to Alofi for $5 per person. Once loaded into the van, we immediately began chatting with the shuttle driver. His name is Palemia and he is from the nearby island country of Tonga. He moved to Niue from New Zealand about one year ago with his wife Louna and their children, Mele, Romeo, and Moni. Jono told Palemia about his free-diving hobby and how he was hoping to go fishing at some point. This sparked some interest from Palemia. He asked Jono if he had brought a spear gun. Sure enough, Jono had it along with him but had been disappointed to find out the strict rules with fishing around Niue. To spearfish in Niue, you either have to fork over $500 to a charter fisherman who will begrudgingly take you or you have to be lucky enough to befriend a local who will take you for free. Jono was ecstatic and I was excited for him to have a chance at spearfishing with a local. Eventually we asked Palemia more questions which led us to the idea of offering to help out on his farm. Palemia told us he plants timala, a kind of sweet potato, and sells them to the locals. He said they were in the middle of planting them now because they're best planted during the full moon. “Do you want a hand?” Jono asked him. “Oh, you have headlamp? Okay! I come pick you up again at 10:30.” And just like that, we were on our way to doing some midnight farming. Timala is a purple sweet potato with white flesh—similar to what the Maori in New Zealand call “kumara.” The Niueans pronounce it “tSee-MA-la,” with an almost silent t.
We put woven baskets of timala plants into the back of Palemia’s 4x4. Then we took a dirt road with him and Louna back into the jungle. Up and up we climbed the bumpy terrain to a plateau. We seemed to be at the center of the island. The trees grew shorter here and a large field opened to the night sky. There were many stars out twinkling above us when we arrived. We walked into the middle of the field, careful not to step on their previously planted timala. Palemia set up a standing light rigged to a battery. Now I could see we were standing on loose soil. Palemia had spent the days before churning up a layer of vines and grasses with a pitch fork to reveal a rich layer of soil underneath. It was nice dark soil, perfect for farming. Palemia set Jono to work digging up another section of the field. Meanwhile, Palemia pushed the soil into small hills for me and Louna to place the plants. Proper placement of the timala plants took a little time to learn but then it was easy. After Louna re-planted my first two timala, I’m proud to say I got nods of approval thereafter. Farming success! Soon, the stars became sparse in the sky and a light drizzle fell. We kept working, but Palemia was worried it would rain harder. We finished about 50 plants and Jono dug about 40 holes before we began packing up. It was past midnight by the time we arrived back to the Tongia family home. When we got back to their home, we sat in plastic chairs and drank tea from stained mugs while Palemia entertained us. He happily answered questions and told us stories as he strummed on his guitar. He explained his daughter Mele would be traveling to Australia soon. We learned we would be on the same flight as her leaving Niue next week! Palemia is also a traveler, as he has been to Fiji and Tahiti in addition to Niue, Tonga, and New Zealand. Looking around their home, it was clear to me they lived pretty simply. The main room of the house had a small bed in the corner, an internet router on the floor, and a picnic table dining area. Out the back door was an outdoor kitchen and some other rooms off a concrete walkway. Religion is clearly important to the Tongia family, as I noted the walls were nearly bare except for a simple religious passage. The following day, Jono met up with Shane. Shane is another local Tongan fella living on Niue. He took Jono out from the Makefu Sea Track and down the reef wall to spear fish. I spent my time whale watching and snorkeling the reef flats after visiting a few caves nearby. As I was whale watching, I spotted the two of them through binoculars making their way along the wall. When they returned from 5 hours of free diving, they had gotten lots of fish. Jono was hoping to spear a Wahoo, Mahi Mahi, or Yellow-Fin Tuna—but he had no such luck. Instead they had speared a bunch of small reef fish. Apparently the locals will kill and eat just about anything regardless of size! Jono gave most of the fish away to the locals, but we kept one trevally to bring over to the Tongia family for dinner. Back at the Tongia family’s house, we met Romeo and also their youngest son, Moni. Moni loved showing off his artwork to me. Soon, dinner was prepared. 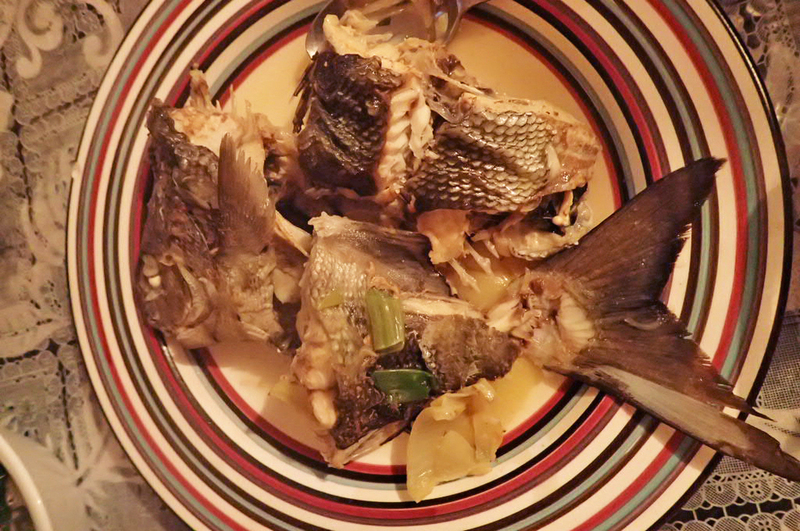 Louna served the fish to us with some sides, including timala! Of course this was not the same timala we had planted the night before. Even still, I loved getting to eat a meal we had caught and planted ourselves, then cooked by a local. Not only was this a fantastic cultural exchange—it was also a delicious one! The best cultural exchanges I have experienced during my travels have happened spontaneously. 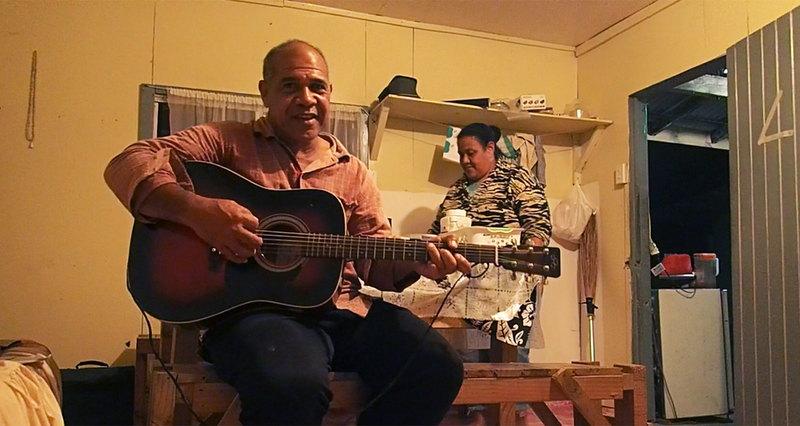 Spending some time with local Tongan immigrants while in Niue was a really unique experience. We learned how they plant their crops, how they spearfish, and then we got to have a home cooked meal. You just can’t plan these kinds of interactions! And all of this occurred simply because we chatted with our shuttle driver! Rather than trying to find authentic, off-the-beaten path experiences or deviations, most of the time these experiences will find you. You just have to be open to them!